VeryPDF RSS to Email delivers updates from all of your favorite news, feeds, and blogs directly to your email inbox, giving you the flexibility to stay updated whilst on the go. Just enter your RSS feed URL, set how frequently you send (daily, weekly, or monthly) and how many posts you want to include. That's it - you're all set! Now every time there is a new blog post VeryPDF RSS to Email will automatically send a campaign to your subscribers. If you have a blog, you may want to use an RSS campaign to email new posts to your subscribed contacts. RSS campaigns use merge tags to pull in RSS (Real Simple Syndication) content from a blog feed. When an RSS feed is updated with new blog posts, VeryPDF RSS to Email will pull that content into the campaign and send it to your subscribers on the schedule you choose. Some people prefer to get news via email instead of checking blogs or using an RSS reader. With RSS-to-email, you can publish your content once and send it to your email subscribers without even thinking about it. Create your own RSS template, and control how many posts go out and how frequently you send—daily, weekly, or monthly. And don't worry: A campaign will only go out when you post something new. If you're feeling fancy, you can even combine multiple RSS feeds into one email newsletter. If you'd like to receive an email whenever a certain RSS feed is updated, use VeryPDF RSS to Email to automatically listen for new RSS feed updates. Whenever a new feed item is posted, VeryPDF RSS to Email sends an email to a specified address. 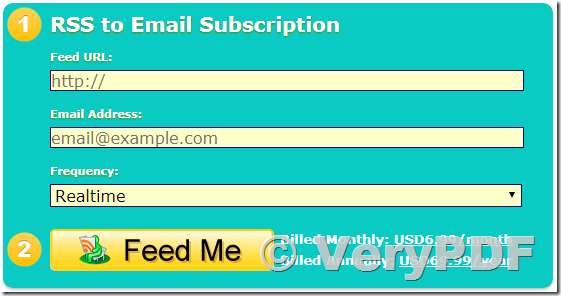 RSS Feed vs. Email Subscription: What’s the Difference? Free Realtime RSS and Atom feed to email service. Get your favorite blogs, feeds, and news delivered to your inbox. How to read RSS news to your mobile phone totally free? How to view big PDF which can be supported on iPod touch? How to upload any file to cloud for long term storage? This entry was posted in VeryPDF Cloud API and tagged rss feed, RSS news, rss to email. Bookmark the permalink.